Instead of fumbling through the entire contents of a kitchen cupboard only to find your wildly out of date selection of spices you didn’t even know you had, how would it feel to open up a neat and organised kitchen larder full of all your favourite cooking and food ingredients? Kitchen larders were originally a trend of the 1950s, but thankfully they are back in a big way, adding style and practicality to your kitchen. Kitchen larders are usually cool and dark, making them a great space to store dry food items, but can also be used to store or display kitchenware and accessories. They are normally spacious storage areas, making it easy to see, and get to, all of your ingredients. Kitchen design has come a long way since the 50s, which means that larders can look stylish and even be a main focal point of your kitchen. They can be nifty in their fitting too, for example the pull-out larder. 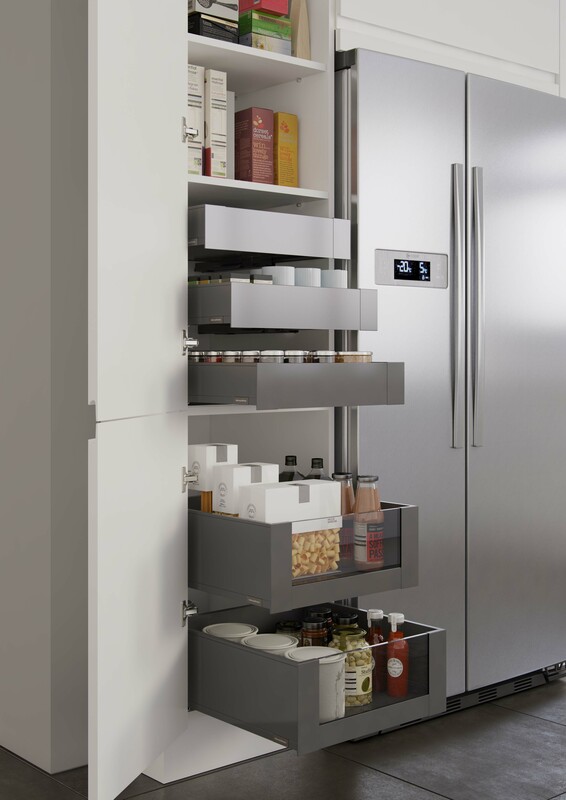 The pull-out larder saves on space in the kitchen, but has a large amount of storage capacity. 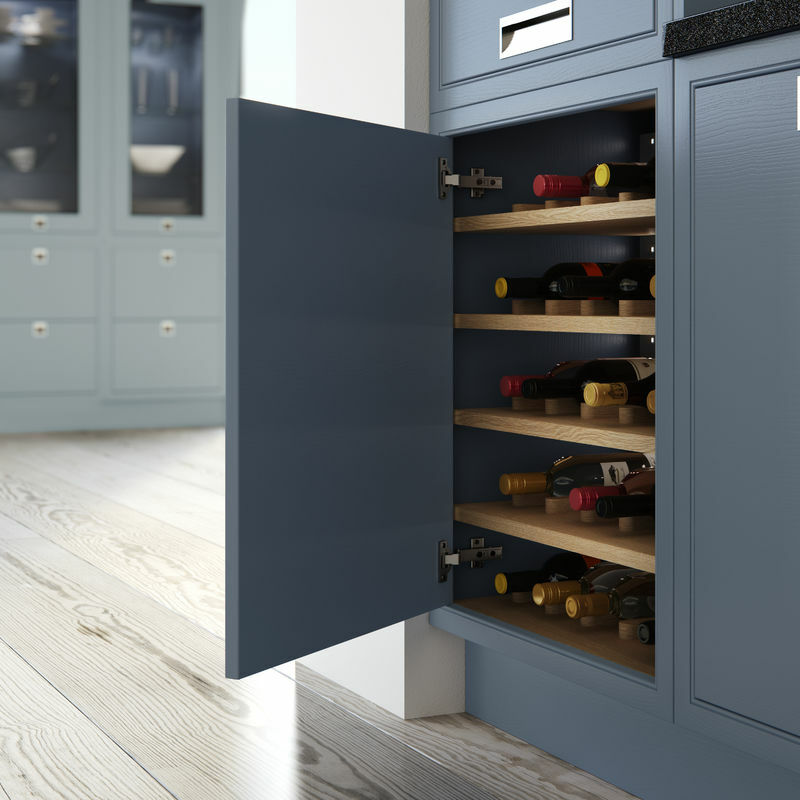 At Thatcham Kitchens, our kitchen showroom in Berkshire showcases some of the larders that we fit in our handmade kitchens, so you can really get a feel for how a larder would suit you and your kitchen. We have expert advice on offer all day every day, to help you decide on the right larder for your bespoke kitchen design. We can show you the larders we have in our showroom, as well as images and brochures of the many more larders we can fit in your kitchen. Kitchen larders come with all different types of storage from wire racks and spice racks to sauce bottles and wine storage. Having a kitchen larder could literally change your life and the way you cook, making it simpler and more enjoyable. As our kitchens are bespoke and handmade, you can choose the shape, colour and accessories for your larder. We are happy to help give you guidance and inspiration when choosing your new larder. Come and see us to talk about kitchen larders and get friendly and experienced support for your new kitchen design. We are on The Broadway in Thatcham (near Newbury, Berkshire) and you can park nearby at Waitrose.